The school has well-regarded graduate programs through the engineering school, Hough Graduate School of Business, Levin College of Law and the College of Medicine. The university is also integrated with retirement community Oak Hammock, where students can work, complete internships in health sciences and find mentors. Famous graduates of the University of Florida include home repair television sensation Bob Vila, Heisman Trophy winner Steve Spurrier and former U.S. Sens. Bob Graham and Connie Mack. The University of Florida is a comprehensive learning institution built on a land grant foundation. We are The Gator Nation, a diverse community dedicated to excellence in education and research and shaping a better future for Florida, the nation and the world. Our mission is to enable our students to lead and influence the next generation and beyond for economic, cultural and societal benefit. The University of Florida, the state’s oldest university, traces its beginnings to 1853. Today, the university has more than 50,000 students and 16 colleges. 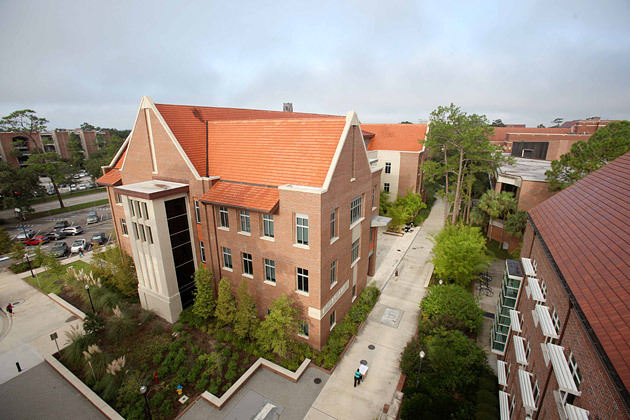 UF has a 2,000-acre campus and more than 900 buildings on the main campus. Since 1985, UF has been a member of the Association of American Universities, which includes the top 62 public and private institutions in North America. UF is consistently ranked among the nation’s top universities: No. 14 in U.S. News & World Report “Top Public Universities” (2013); No. 3 in Kiplinger’s “Best Values in Public Colleges” (2013). Nearly two-thirds of UF students graduate with no student loan debt, compared with two-thirds of college students nationally, who graduate with student-loan debt. UF has 38 Eminent Scholar chairs and over 40 faculty elections to the National Academy of Sciences, Engineering, the Institute of Medicine, or the American Academy of Arts and Sciences. UF faculty attracts nearly $700 million in funding and averages 300 new inventions each year and more than 100 biotechnology companies have emerged as a result of UF research. UF excels in its student-athletic program, which has been a Top-Ten program nationally for the past 30 years and whose athletic victories include 31 national team championships, 213 SEC titles, and more than 250 individual national titles. In January 2014, the university enrolled the first students in UF Online, the university’s online arm for undergraduate degrees. UF currently offers nine online undergraduate degree programs, including biology, geology and sports management. The university projects 24,000 students and 35 degree programs in ten years. UF began the renovation and expansion of its signature J. Wayne Reitz Student Union. The $75 million project, which will add 100,000 square feet of dedicated space largely for student offices, clubs and organizations, is expected to be completed by fall of 2015. UF continued its preservation and restoration efforts of more than three dozen state-owned properties in historic St. Augustine, renovating the iconic Government House and opening the First Colony Exhibit there. The exhibit tells the story of native Floridians and Spanish Colonial Florida as St. Augustine prepares for its 450th anniversary celebration in 2015. The university began construction of Cypress Hall, one of the first residence halls in the country to feature rooms specifically designed for students with significant physical disabilities. Up to 30 rooms in the new residence hall will be equipped with lift systems and other technology to assist these students. UF’s Office of Technology Licensing continued its pioneering efforts to attract and support more female inventors and entrepreneurs through the Empowering Women in Technology program. The hands-on program, which covers everything from forming companies to writing business plans, has reached over 100 women many of whom are now actively engaged in the local innovation community. The university’s Smathers Libraries added the Judaica Suite, a suite of artfully designed reading rooms devoted to making the volumes of UF’S Isser and Rae Price Library of Judaica more visible and available to patrons.